My granny certainly would not have identified with the recipe I am presenting here today. It would have been way too elaborate and not traditional enough. She probably wouldn’t have been able to pronounce the word Crème Brûlée anyway. Her only comment would probably have been, “Another one of these new dishes”, meaning that she would never try this recipe. Yes, that was her, my dear Granny. 😉 But on the other hand, I have to admit that in those days, when I was a teenager or in my early twenties and when I was looking over her shoulder and learning the basics of cooking from her, I didn’t know myself what a crème brûlée was and how wonderful it tasted. 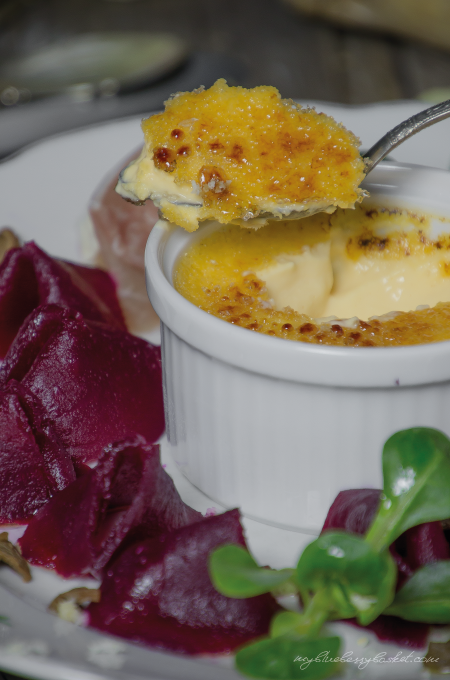 With this recipe of a horseradish crème brûlée I somewhat deviated from the original sweet dish and flavored it with freshly grated horseradish in order to turn it into a side dish for my beetroot carpaccio. 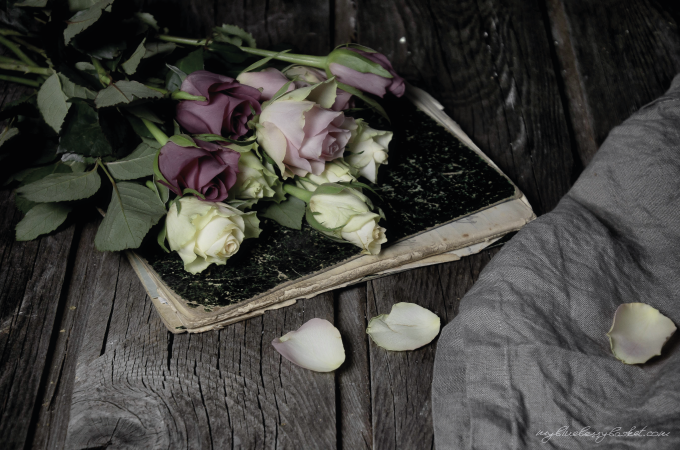 I think that the combination is a good one and I’m looking forward to your opinion! If you don’t have a gas torch at home, you can also use the broiling function of your oven instead. When the grill is really hot just put the ramekins under it and broil for about 2 minutes (depending on the actual heat). Make sure that you keep a constant eye on them as you don’t want to burn your crème brûlée. For the Horseradish Crème Brûlée bring the milk, cream and the coarsely grated horseradish to the boil and remove from the heat immediately. (Be careful not to boil over!) Cover the saucepan and allow to cool completely, at least for 2 hours, best overnight. This allows the milk and the cream to get flavored by the horseradish. For the mushroom oil soak the dried mushrooms in boiling water. Drain them when they are soft and squeeze hard to get all the water out of them. Chop finely and add to the salad oil. Allow to get infused for some hours or overnight. Preheat the oven to 140°C /280°F. Strain the milk-cream mixture into another saucepan and discard the horseradish. In a separate bowl whisk the egg yolks with some tablespoons of the milk-cream mixture before combining it with the rest of the mixture. Add the salt, sugar and the grated nutmeg for seasoning and also add the finely grated horseradish. Heat over medium to low, stirring constantly. Don’t bring to the boil! When the mixture starts to get a creamy texture pour into the crème brûlée dishes (ramekins). Put the little dishes into a larger ovenproof dish and pour some boiling water into the larger dish, just enough so that the crème brûlée dishes are up to about 2/3 in the water. Bake in the preheated oven for about 50-60 minutes. Remove from the water and allow to cool completely, then chill in the fridge for some hours or overnight. For serving cut very thin slices of the beetroot (with an electric bread cutter or a very sharp knife) and arrange on four plates. Season with sea salt and sprinkle with mushroom oil and some balsamic vinegar. Roll up the slices of prosciutto and arrange on the plates. Garnish with lamb’s lettuce or arugula and freshly grated horseradish. Take the crème brûlées out of the fridge and sprinkle with caster sugar. In order to get the caramel layer on top of the crème brûlée you can either melt the sugar by preheating the oven to broil and putting the dishes under it (for about 2 minutes, watch carefully so as not to burn!) or by using a torch*. Then hold the flame just above the sugar and move it around until the sugar has caramelized. 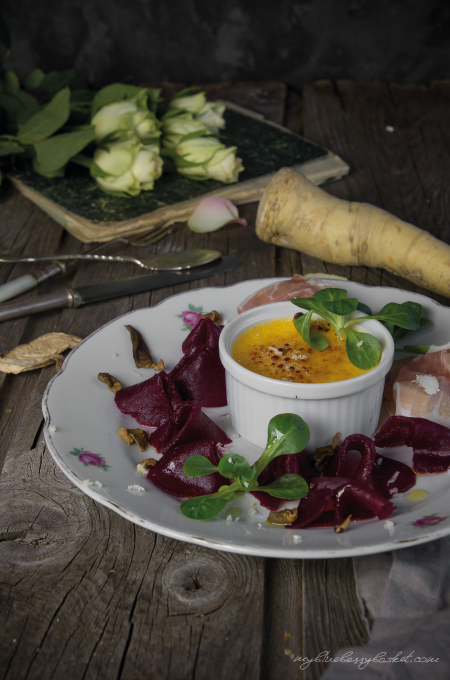 Serve the horseradish crème brûlée with the beetroot carpaccio and some fresh bread. * PROPANE GAS TORCH SAFETY: Propane gas torches are highly flammable and should be kept away from heat, open flame, and prolonged exposure to sunlight. They should only be used in well-ventilated areas. When lighting a propane gas torch, place the torch on a flat, steady surface, facing away from you. Light the match or lighter and then open the gas valve. Light the gas jet, and blow out the match. Always turn off the burner valve when finished using the torch. Children should never use a propane gas torch without adult supervision. 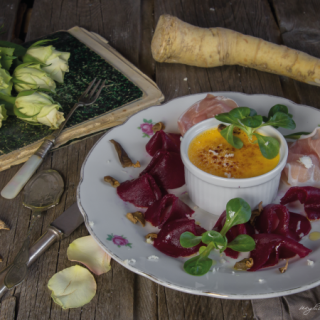 Beetroot Carpaccio and Horseradish Crème Brûlée is a perfect, healthy and elegant starter in winter time, with lots of vitamins and goodness. Strain the milk-cream mixture into another saucepan and discard the horseradish. In a separate bowl whisk the egg yolks with some tablespoons of the milk-cream mixture before combining it with the rest of the mixture. Add the salt, sugar and the grated nutmeg for seasoning and also add the finely grated horseradish. Heat over medium to low, stirring constantly. Don’t bring to the boil! When the mixture starts to get a creamy texture pour into the crème brûlée dishes (ramekins). Put the little dishes into a larger ovenproof dish and pour some boiling water into the larger dish, just enough so that the crème brûlée dishes are up to about ⅔ in the water. Bake in the preheated oven for about 50-60 minutes. Remove from the water and allow to cool completely, then chill in the fridge for some hours or overnight.